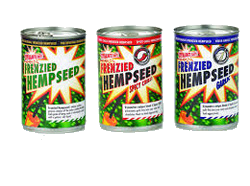 Hemp seed is the seed of the hemp plant this bait was used in the early days of fishing for primarily roach although now anglers have found that it is very effective against other fish but is still successful when wanting to catch roach. Hemp seed isn’t really used as hookbaits for other species besides roach but is a deadly feed for species such as Chub, Carp and Chubb. Well nowadays hemp is used as feed more than a hookbait. You can buy hemp in the tackle shop ready prepared or you can cook your own,use a old vacuum flask and half fill with hemp seed and a teaspoon of bicarbonate of soda, fill with boiling water and leave over night before fishing and the hemp will be ready for you to use in the morning. Hemp can be a exellent bait for roach in the summer with bites being very fast and on the drop. When hooking hempseed choose a seed that has just to say started to split and push the point of the hook into the split, making sure the shank is on the same side of the grain as the 'eye' of the seed, the blunt end. Then push the shank into the eye of the seed but make sure the hook point is protruding unless you won’t be able to set the hook. Always submerge your hempseed in water unless it will dry out and float. Instead of shots use stots as the fish wont mistake them for the hemp and you won’t get line bites. Putting too much hemp into a swim can spell disaster so the rule is little and often put in about 10-15 grains every cast.